Enter your "ship to" name or log in to your address book. Retail Price: $23.99 Log in for LOWEST PRICE! Situated on rocky slopes of Mount Ventoux, the soil at Cave Beaumont du Ventoux is characterized by a mixture of clay and limestone. The vineyards, planted between 400 and 500 meters of altitude, benefit from cool nights and sunny days. Thus, the grapes reach optimal maturity, making wines that are naturally well balanced. The Ventoux appellation is the winegrowing area in the southeastern Rh?ne region of France. Here, wine is produced in 51 communes of the Vaucluse d?partement, along the lower slopes of Mont Ventoux, at the foot of the Vaucluse Mountains. The grapes were both hand and machine harvested, and underwent a short, high-temperature maceration for five hours (at 150 ?F) in stainless steel vats. Next, the fermentation process was conducted at 65 ?F, without any skin contact. After the malolactic fermentation, the wine was aged in concrete vats for six months before bottling. This wine is so well rounded that it will pair incredibly well with grilled meats and vegetables. Try tossing some asparagus with olive oil, salt and pepper, then grill those spears for a wonderful side dish. This wine could also be used in a marinade for steaks and roasts. This wine has a beautiful color mixture of shades of red and pink, thus creating a medium ruby color in the glass. 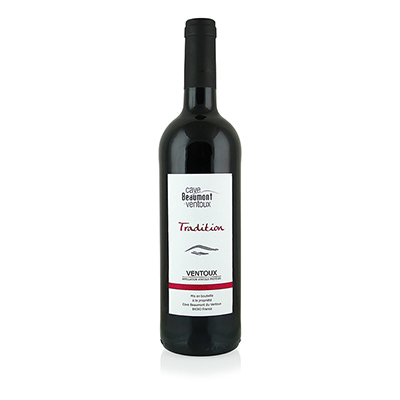 The nose suggests well-blended fruit with aromas of raspberries and blackberries. On the palate, you'll notice a wonderfully round and fruity wine with a fresh finish.